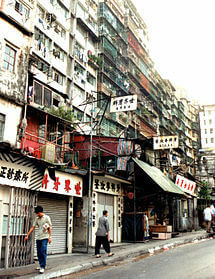 If you arrived in Hong Kong after 1994 you will not have seen the Kowloon Walled City. And even if you have lived here all your life or came to Hong Kong before the mid 1990s you may not have been inside this fascinating and densely populated area. It became an enclave after the New Territories was leased to Britain in 1898. It’s demolition began in March 1993 and was completed in April 1994. Kowloon Walled City Park occupying the area shown in the photo left opened in December 1995. What connection does KWC have to Hong Kong’s industrial past? Well it contained a large number of businesses including numerous small factories. These included a fishball factory, a noodle factory, several metalworking shops and a textile mill. If you can provide more information about what else was manufactured there please leave a comment under this article or contact the group. This article was one of the first to be posted on the website on 11th January 2013.